But that notion faded fast away with every bite. It mayyy have also helped that I get them already peeled and everything. Maybe. The awesomeness of this recipe lies in its simplicity. You round up everything, do a little chopping and a little sauteing and BAM, dinner's ready. A challah is a must here. No exceptions! If you're on a diet, I'm sorry for you. Go eat something else! One last thing before I get to the recipe - I'm going away again! To Italy :) You are welcome to follow my deeds on Instagram. 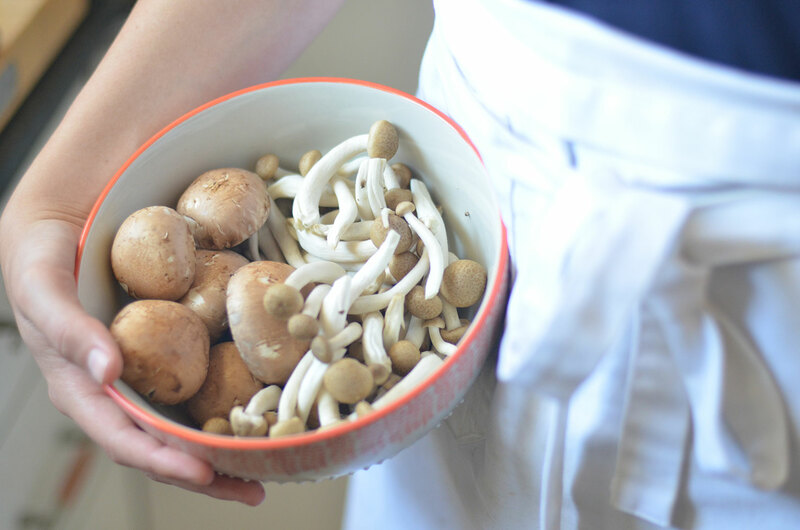 Cut the portobello mushrooms into medium sized pieces. 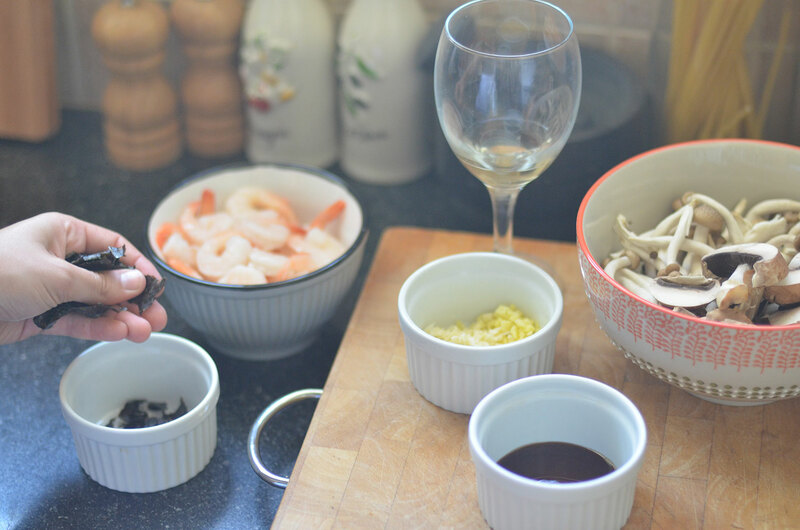 Organize all of the ingredients in little bowls that will be easy to reach when you are handling the skillet. 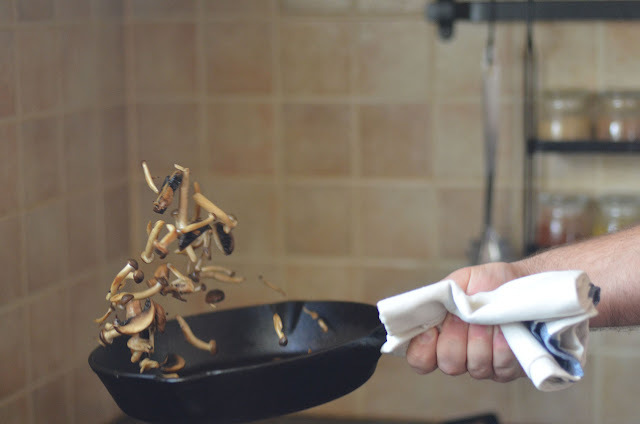 Heat up a teaspoon of butter on high heat in a cast iron skillet and saute the mushrooms on either side just until they get a bit of color (you can try flipping them in the air - it's fun! - but expect half of them to land anywhere but the skillet the first few times). 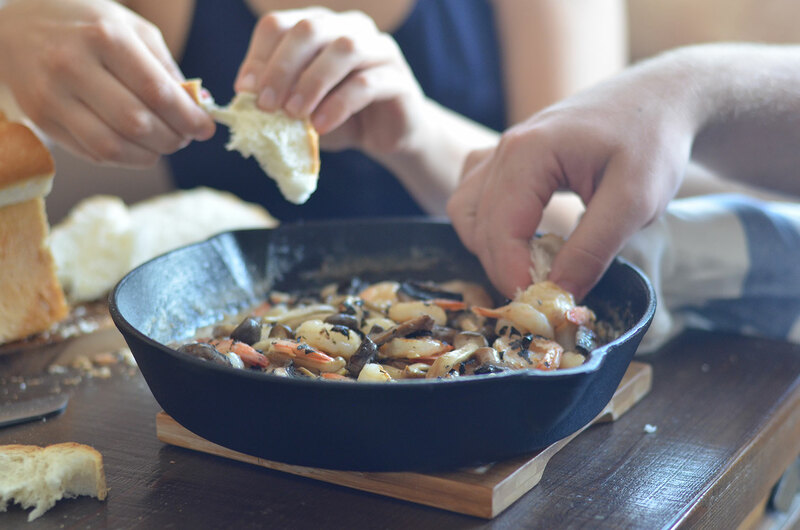 Remove them from the skillet and set aside for later. 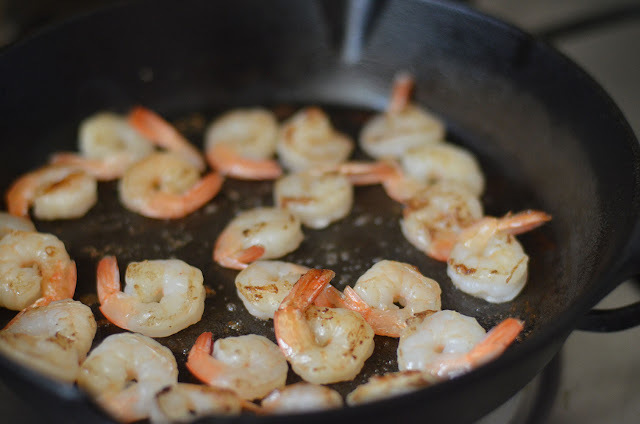 Add 2 more teaspoons of butter and saute the shrimp on both sides, not too long, you don't want to dry them up, just to add a bit of color. Remove and set aside. If the skillet is dry at this point add a little bit of butter so nothing would stick to it and burn, we don't want that. 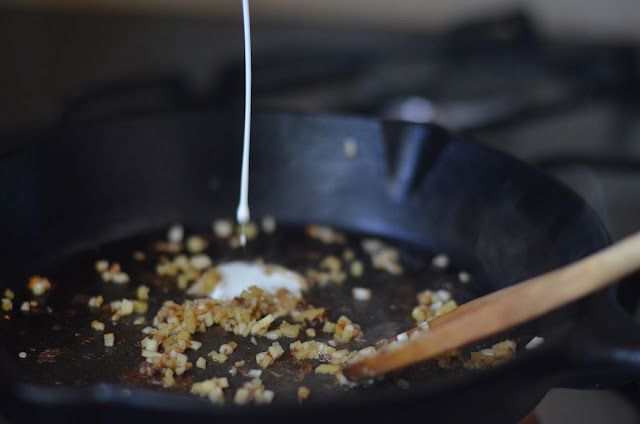 Reduce the heat to medium-high and saute the garlic and ginger until you start smelling garlicky aromas. Add the wine and stir, then add the cream and oyster sauce. Stir everything well and let the cream thicken for a minute or so. Stir once in a while so that it doesn't develop a skin. 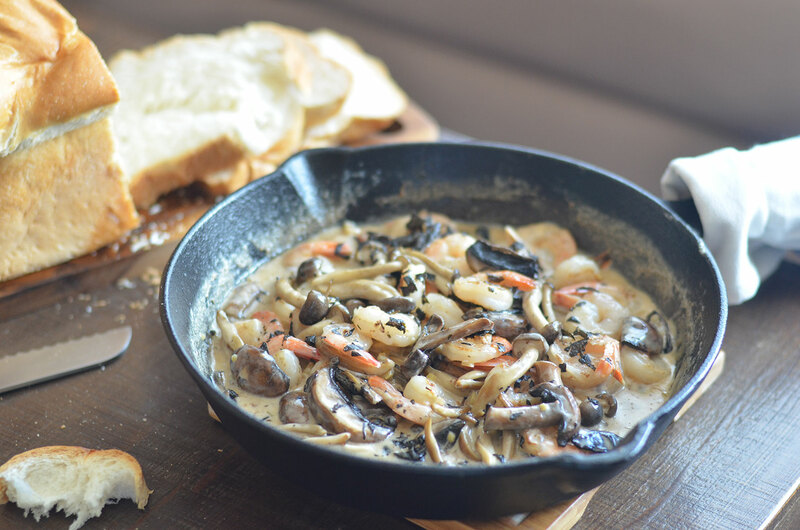 Stir the mushrooms and shrimp back into the skillet, and heat them up a bit. Remove from the heat and scatter the dried seaweed on top for garnish. Eat along side a challah (or some other bread that is good at soaking up sauce). Nom. 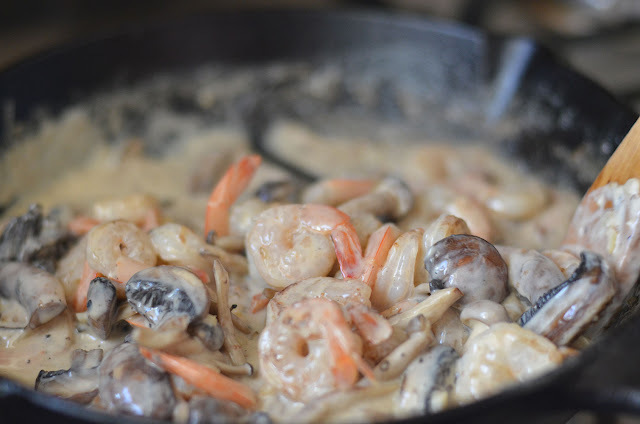 * The shrimp I am using here are thawed, if you're using fresh ones their cooking time may be longer.